The two softwares discussed in the webinar are ENVI and SARscape. ENVI Desktop, enterprise and cloud solutions include ENVI UI, ENVI workflows, ENVI Modeler, ArcGIS Pro and Desktop-Enterprise-Cloud. SAR processing includes all of the above, implementing ENVI Modeler where you can automate all the SAR processing. All tools and technologies integrate seamlessly with Esri. Harris Geospatial is offering a limited time Fast Start Support Bundle for those interested in learning to use ENVI SARscape. Harris is using Synthetic Aperture Radar (SAR) for agriculture monitoring and many other applications. Many benefits SAR are seen in agriculture. As agriculture is grown where there is frequent rainfall and cloud covers, weather masks a lot of information such as plant health, growth and biomass. UAS and UAVs are prone to miss large periods of time because of the weather, but SAR can gather information in spite of inclement weather. 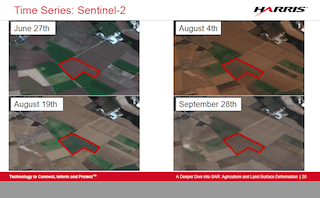 “Another benefit of SAR is that with the different bands and polarizations, we can gather unique information on crops that can be used to get different characteristics than with optical imagery,” said Gallagher. 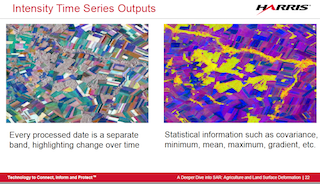 In the presentation she displayed the difference between an optical and SAR image (see image above). The optical image is a Sentinel-2 scene from June 20, 2018. Green vegetation and barren fields are visible. With analysis such as using spectral indices and time spatial analysis, the SAR image is a TerraSAR-X image from June 18, 2018. There is a large difference in backscatter in SAR. The backscatter of SAR is affected greatly by crop type, soil moisture, and geometric effects, thus making certain vegetation look very different from other green vegetation around it. Areas that are bright white have a high intensity of spots. As the more vegetation the denser, the larger the leaves, and some other factors, the more the intensity is going to be scattered back to the satellite. On the opposite side if it is bare flat soil or wet soil, it will act similarly to other flat surfaces and reflect most of the backscatter away appearing black in the Harris imagery. Radar bands are the frequency of the signal that is emitted from the instrument. Band frequency is directly related to what is seen by the SAR sensor, so for example, longer wave lengths or lower frequencies SAR signals penetrate deeper into material such as vegetation soil. In addition to penetration depth, the band frequency will also determine the size of features your SAR data is sensitive to. Waves interact with features that are similar in size and sees materials of similar scale such as leaves on trees. Usually the L and P bands have longer wavelengths and are dominated by soil backscatter. They are used mainly for soil moisture and information vegetation. C and X band interact mainly with the canopy. X band works well with broad leafed plants (e.g. corn and soybeans) while both X and C work well with narrow leafed plants (most grains). 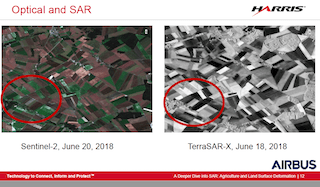 TerraSarX and Sentinel-1 data were used in the webinar to gain information off of the canopy and the volumetric scattering that happens as the plants grow over time. There is other useful information gathered as to how these bands tend to react to different crop types. There is a marked difference between grain crops such as rice, soy or barley as they are much easier to track with SAR and see than subterranean surface crops such as potatoes. The last thing to know about the band effects is the shape of the crops themselves, said Gallagher. Different growth stages can be seen in the backscatter and with high enough resolution SAR, and differences from plant to plant can be marked. Polarization is the direction of the wave that is projected from the radar. Then the direction of the wave as it is returned after it has bounced off an object. What is meant by this is if the wave leaves the satellite and is oscillating up and down vertically, and hits the ground and returns with the beam oscillating vertically. The more polarizations you have, the more indepth of analysis you can provide. SAR satellites have multiple polarizations, from single pole (such as only VV or VH) to quad-pole (which returns all variations). Each polarization interacts differently with the surface it hits, adding information to the scene. Polarization plays a large part in the information returned from SAR backscatters. Quad Polarized (VV, HH, VH, and HV) has the most information for full understanding of vegetation. Dual Pol (VV & VH or HH & HV) is still able to discern major differences. As aforementioned, weather has an effect on information. Rain/snow causes noise and moisture will collect in the soil and on the crop surface. Wind changes the structure of the plants with their movements. Every processed date is a separate band, highlighting change over time. Statistical information such as co-variance, minimum, mean, maximum, gradient, etc. Different fields have different temporal signatures, allowing for discrimination and classification. Date information, classification, developing hotspots with SAR, agricultural overview, land surface deformation, introduction to interferometry, importance of baselines, are among the variety of topics covered that are vital to the understanding and deployment of SAR information. This entry was posted on Friday, April 5th, 2019 at 11:32 am. You can follow any responses to this entry through the RSS 2.0 feed. You can leave a response, or trackback from your own site.